I ask you....who doesn't love a cute bundle of Fat Quarters?? I know I do!! Sometimes, you know you just need more of a particular color in your stash...and stashes need to be fed from time to time...no matter what non-quilters say. You never have enough fabric...am I right? I've added what I call "color bank" Fat Quarter bundles to my website. All bundles are a fun mix of just my fabrics, designed for the most fabulous fabric company ever....Marcus Fabrics!!!! Starting with my favorite color....RED! Love, love, love!! And there are warm and cozy BROWNS!! And bundles and bundles of creamy, luscious LIGHTS!! 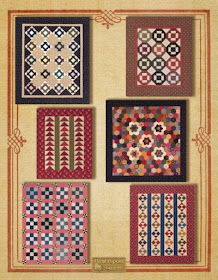 All will be a wonderful addition to your stash and upcoming quilt projects. I can also put together assortments for you, via email request, such as nothing but tone-on-tones, and/or all shirtings, etc. I've been doing that for customers all along, and would be happy to do so for you!! Click here to see all the available bundles and color banks. There will be more color bank bundles added as collections come out, and I have three new collections already in production with more coming later next year! Feeling excited and so blessed. 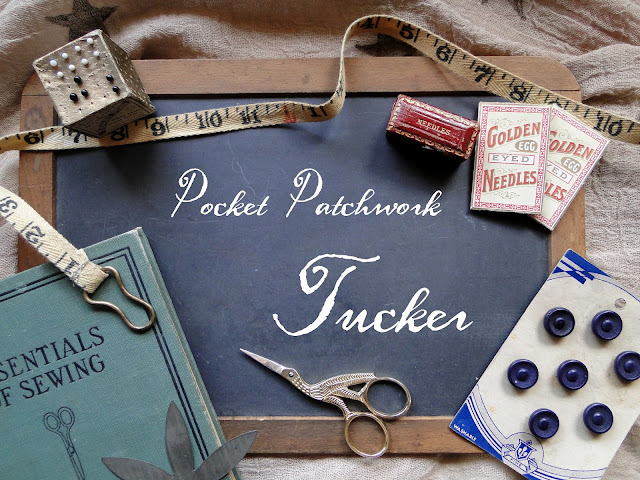 Just a fun reminder.....another FREE Pocket Patchwork Sew-Along is coming very soon! Quilt Storage Out of the Box! 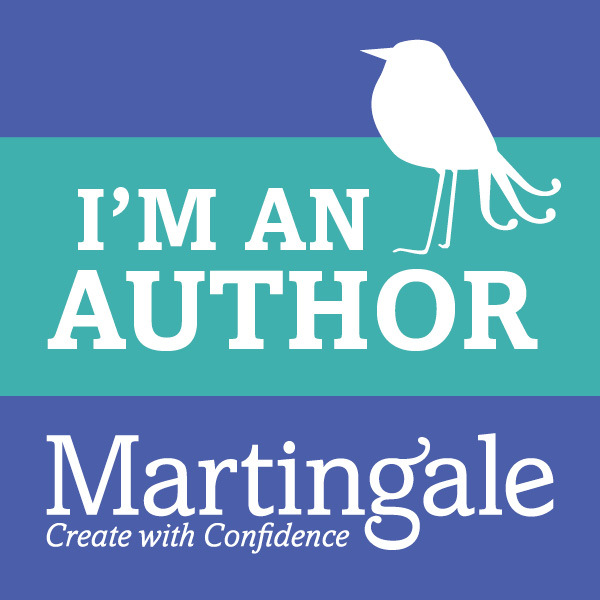 I received an email from Marcia B. that I thought was particularly inspiring, and asked her if I could share her ideas with all of you. Happily, she said YES! 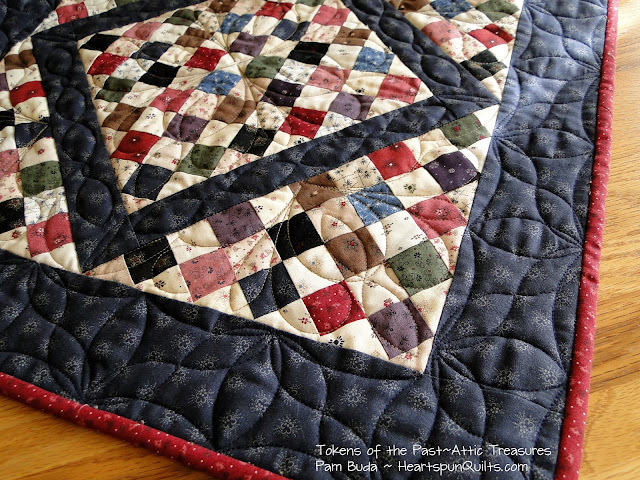 Marcia writes that she discovered awhile ago that she can layer one quilt on top of another so that the borders and other elements of the quilt underneath peek out from behind. 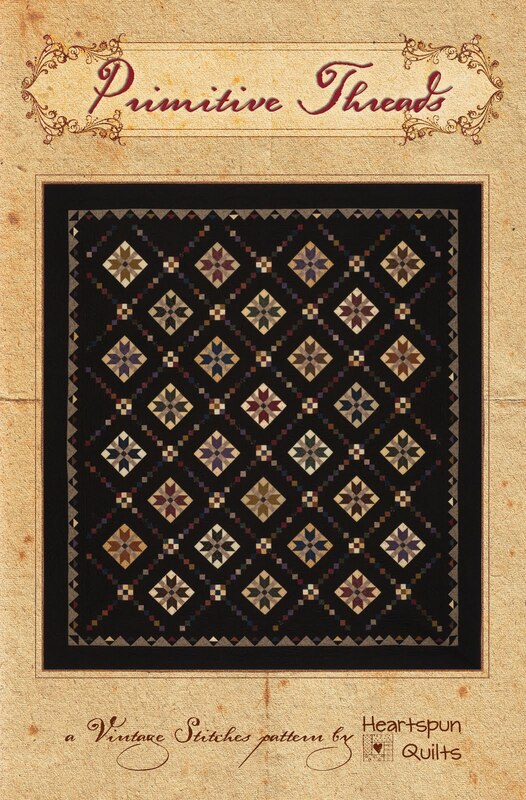 The black applique borders of the bottom quilt extend past the red print border of the quilt on top of it, making it look like a whole new quilt! So, so cute! 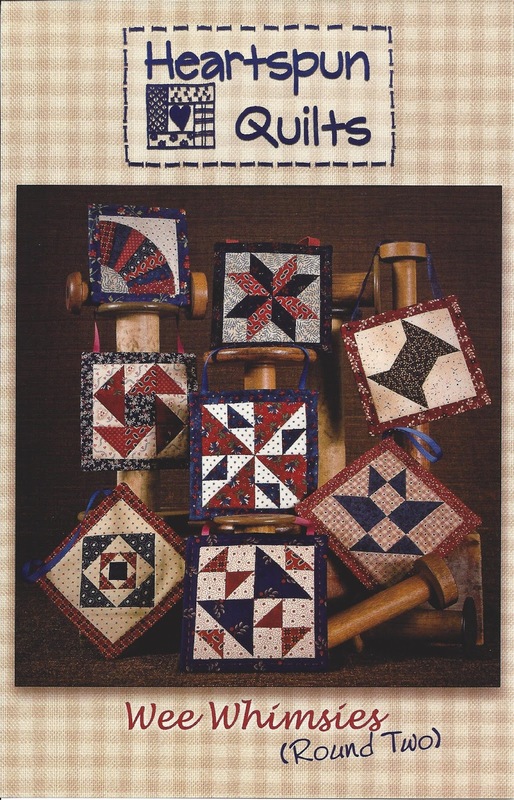 Notice there are two quilts on the very top, turned on point, and flipped over, so only the backings are showing. 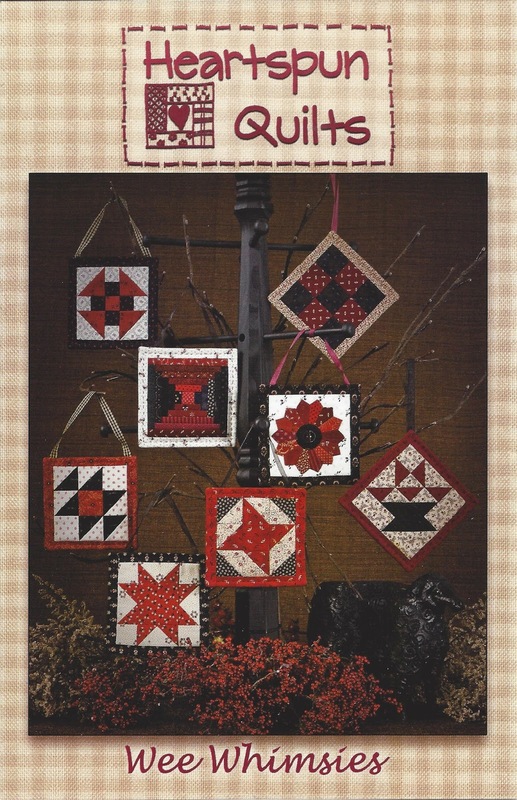 One has the black and white checked binding (a Christmas quilt), and the other a red binding (an autumnal quilt). This idea, she says, makes her think a lot more about what fabric she chooses for backing. Great idea, don't you agree?! Marcia goes on to say "Using my larger quilts folded with the backs showing and layering them over the backs of chairs is now common practice in my house. I don't always want the front to be on display, but if its season oriented, it gets turned around and used for the color or the theme (this quilt with ticking is a large Halloween quilt.) 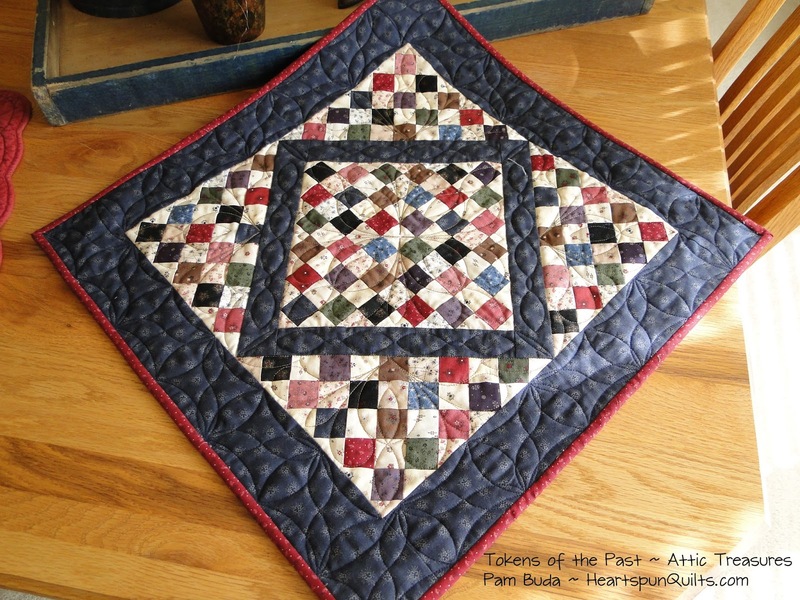 It helps me not to get tired of looking at the same quilt over time, as if it isn't even there anymore....like any decorating." 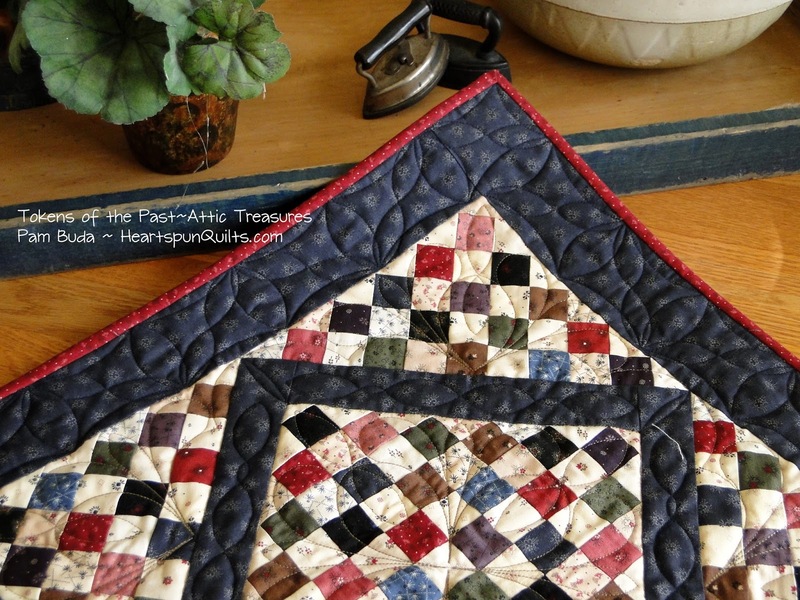 With the small dining room she has, Marcia can "store" seven or more quilts without any of them "clashing or overpowering the space with too much color or pattern. This makes me happy" she says. Marcia layers quilts even when she's showing the fronts. Looks so very comfy!! Displaying the back of her quilts means that Marcia's labels will also be on display. 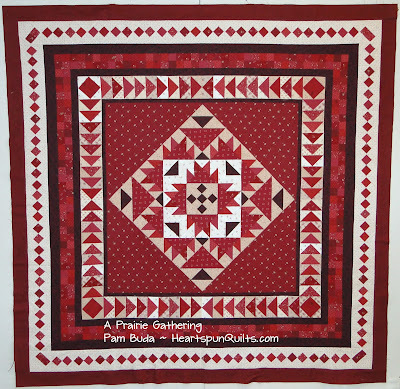 Marcia purposely centered the label on the backing so that when she folded the quilt into thirds, the label would be in just the right spot to show it off. Notice the blue bird? Marcia cleverly tucked the important label information under the bird's wing!! She says "I'm a big fan of paper folding, and this came into play by designing the wing of the bird to unfold as a heart with the information inside. The wing then buttons closed which was labor intensive but worth the effort." We wholeheartedly agree!! She goes on to say "the black backing fabric really shows off the labels, and also looks great." I really, really does! Marcia says "I now challenge myself to come up with creative labels and color specific backings to make the layering even better. It has given me a unique way to make my quilts standout a bit, and has opened my mind to possibilities that I never would have thought to do. I do more labels on the front than on the back, and "hiding" them is so much fun!" Notice the sashing print to the bottom right of the wing applique. Marcia told me "The flap above looks a bit like a regular sashing between the flags. It is re-enforced with light interfacing and hand quilted before being sewn in place along with another flap that will be the actual label. 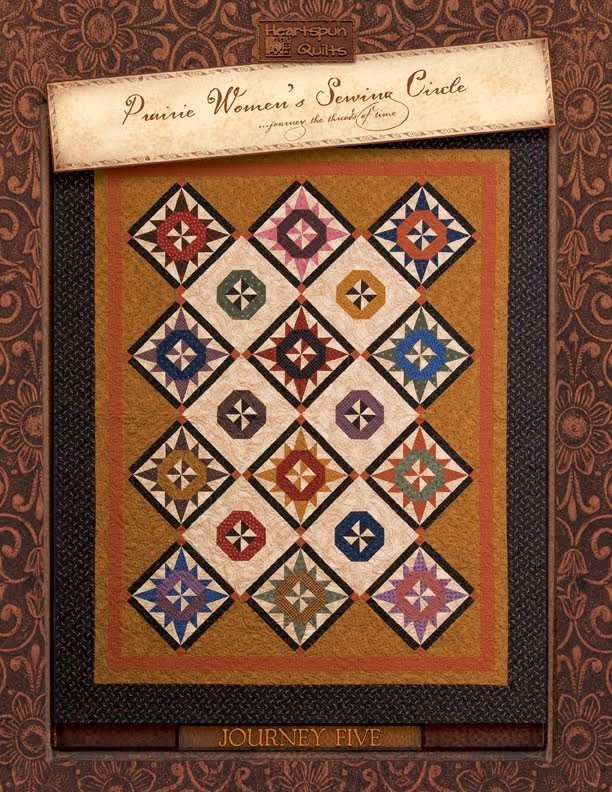 it doesn't take away from the overall design and works well for a wall hanging quilt." How wonderful is that?!! I leave you with more of Marcia's lovely words as she writes "Our homes are the gallery of our works in fiber art. " Marcia...you are absolutely right, and I have truly been inspired by you and your gorgeous quilts! Thank you from the bottom of my heart for sharing your beautiful quilts and ideas with us all. Introducing my newest pattern in the Tokens of the Past series, called Attic Treasures! Once again, the units and blocks for all three of these cutie quilts were made from just one 10 inch precut of my new Antique Cotton fabrics (for Marcus Fabrics)!! Add some yummy sashing, border and binding fabrics and you're all set. 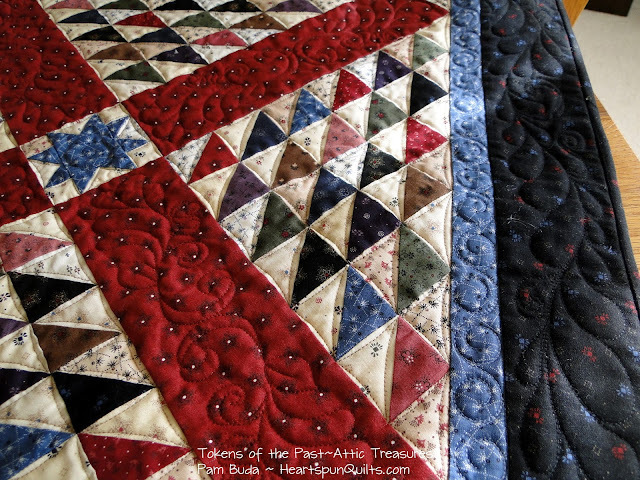 I thought you'd like to see some up-close pictures of the quilts, and the wonderful quilting by my friend, Ronda. 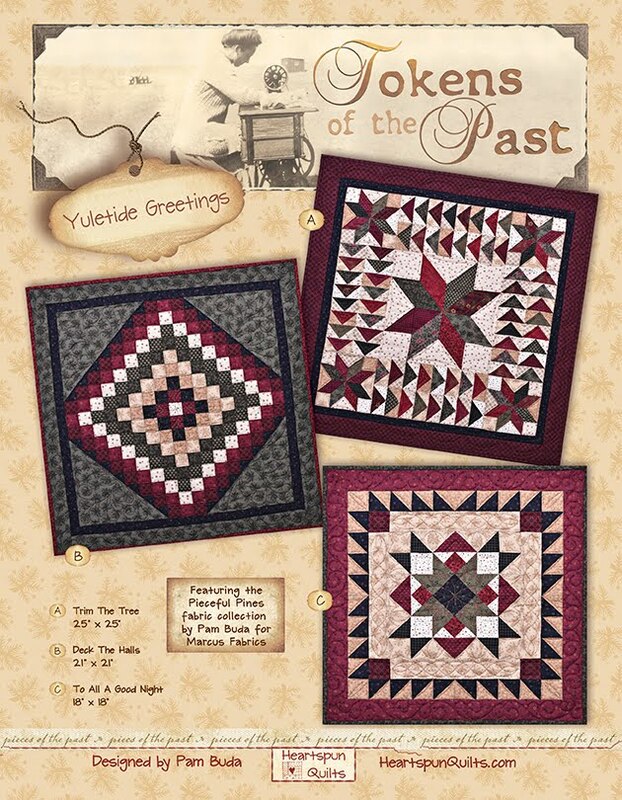 The first quilt is called Back In Time. 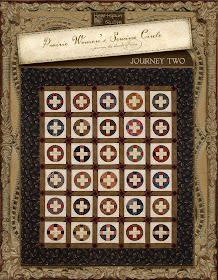 It was inspired by a nineteenth century doll quilt I saw recently and fell madly for. So unusual, so simple, so stunning! 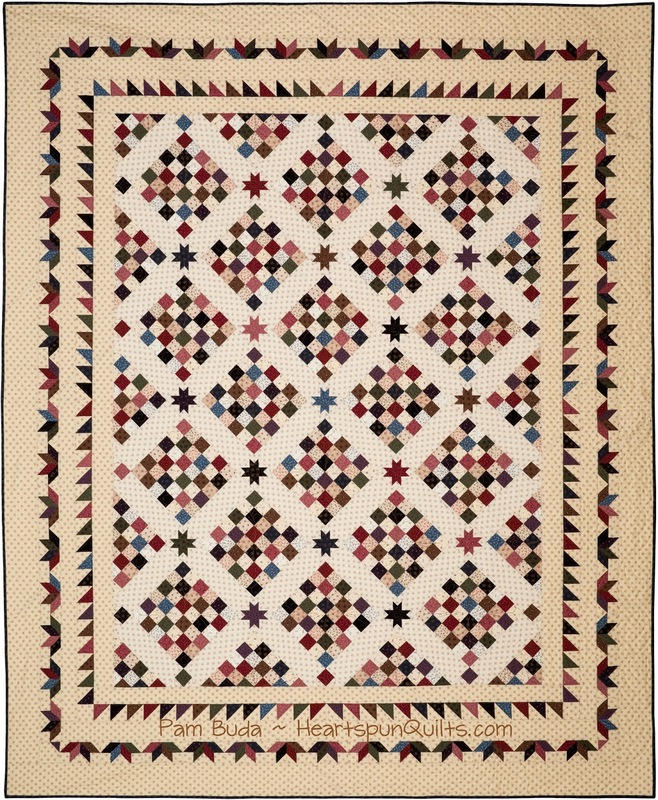 All of the quilts in this pattern were inspired by very simple patchwork. 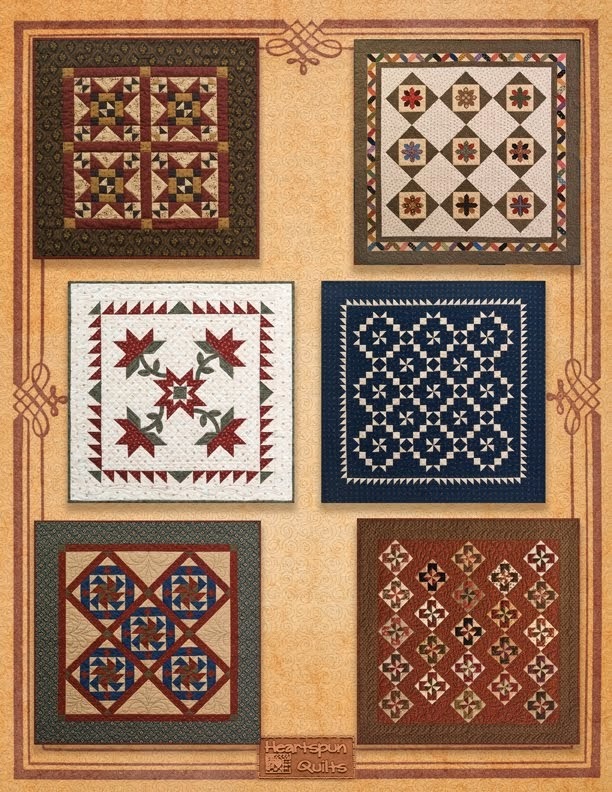 Lovely colors, great fabric prints, and simple patchwork make for classic quilts! Quilt size is 21 x 21. The second quilt is called Remembering Mama. 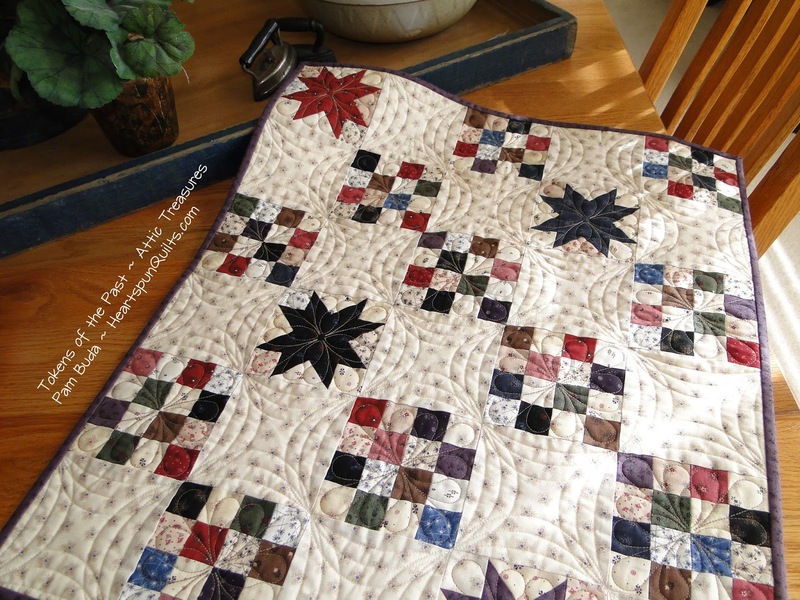 Sixteen Patches and Sawtooth Star blocks make for a simply beautiful combination. 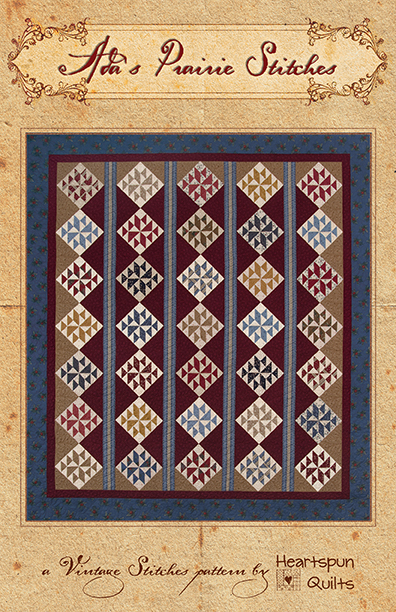 I knew those alternate blocks would be a place for gorgeous quilting, and the design really makes this quilt come alive, don't you think?! 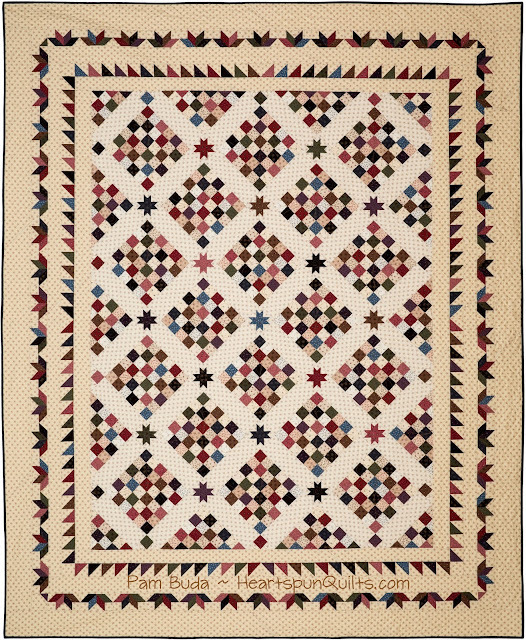 Classic patchwork and great colors and prints really make for another classic, sweet little quilt. Love, Love!! Quilt size is 20 x 24. The third quilt, called Forever Memories, is actually just one large block. I have always loved this block, called Birds on the Tracks, and thought it was a great choice for an eye-catching small quilt. Again, simple patchwork triangles and the sashing X are the only thing needed for a center that really pops in this classic quilt. It was fun and super easy piecing these three small quilts, and I hope you'll have fun making them, too!! Quilt size is 27 x 27. 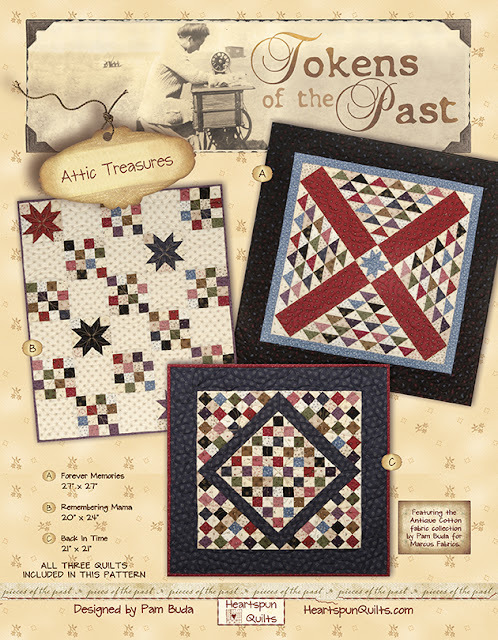 The Tokens: Attic Treasures patterns are available now!! To order the pattern, click here. 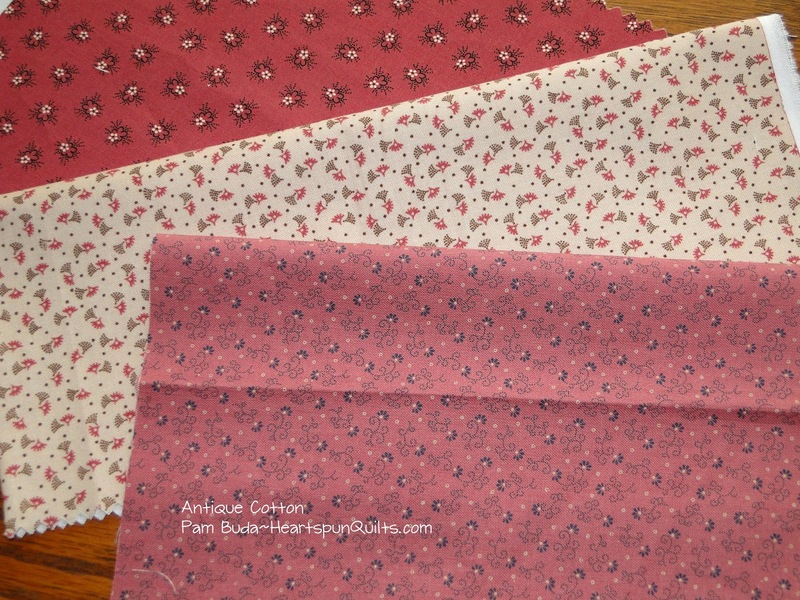 The Antique Cotton 10 inch precuts will be available in early October!! 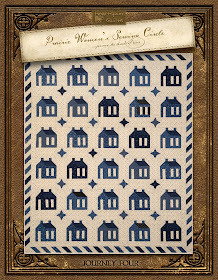 As I so often like to do, I'm inviting you to pre-order the complete Tokens: Attic Treasures Quilt Trio complete kit, which includes the pattern, the 10 inch precut, and all borders and binding to make all three quilts. Regular price for the kit is $111.00. Your special pre-order price is just $96.00!! A $15 savings!! Offer ends October 2nd. 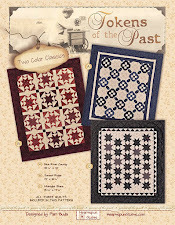 To pre-order your Tokens: Attic Treasures complete kit, click here. 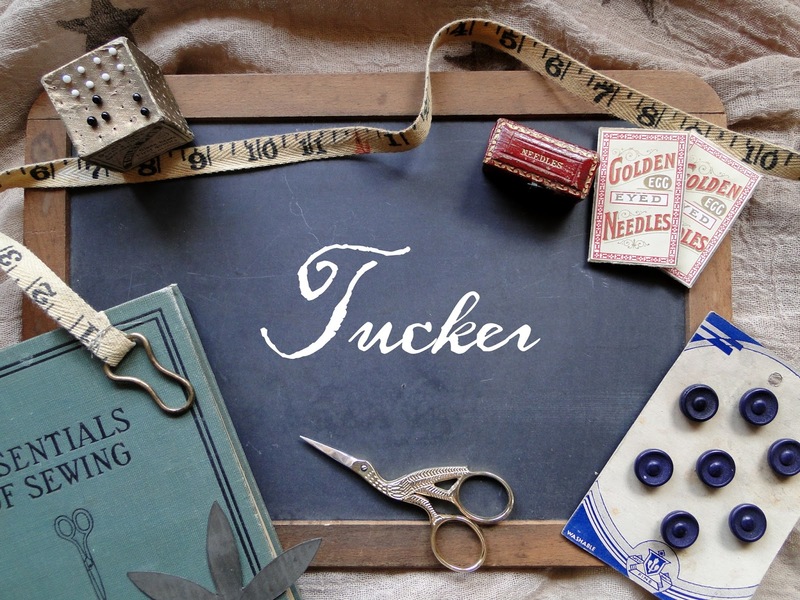 Your kit will ship in October, as soon as the fabrics arrive! This is an exciting month! Another border will be added, and our quilt is growing. I'm sure you enjoyed the drastically reduced cutting this month! Yahoo!! Construction of our Four Patch border is the first task. I've had about half a dozen emails in the last few weeks about pieced borders that don't fit. This is a very common problem! The solution? Hate to sound like a broken record, but measure, measure, measure. 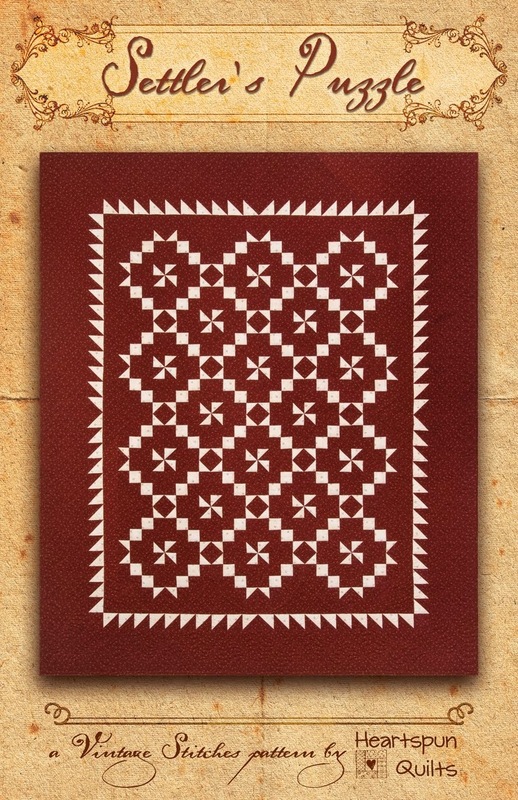 So much of quilting is mathematics....like it or not. Our impossible mission, should you choose to accept it, is to make as close to a perfect quilt as your skills allow. Unless you're willing to take months, if not years making the perfect quilt, it's not likely that each and every unit and block will be truly perfect. 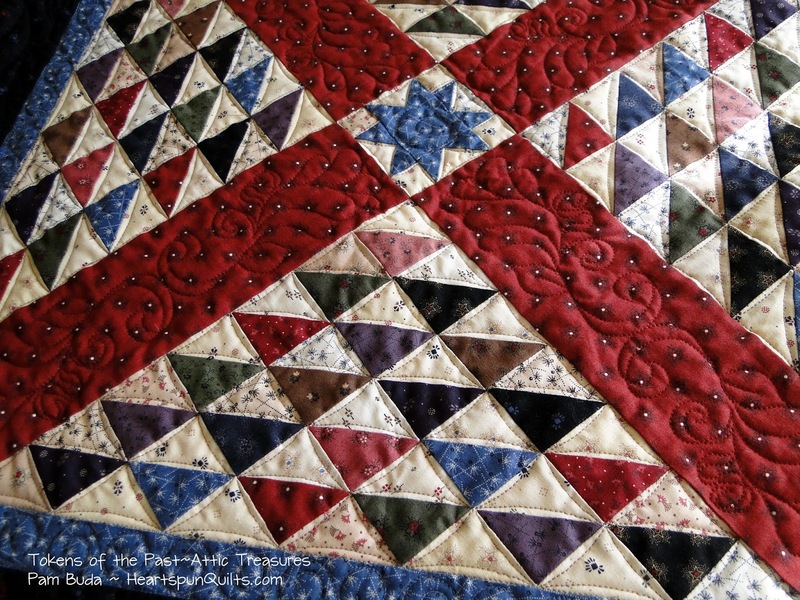 I promise you, the only truly perfect quilts I make are constructed in Electric Quilt!! Your (on point) Four Patch blocks should measure 3 1/2 inches. Sew 7 pairs together, press, then measure again. They should measure 3 1/2 x 6 1/2 unfinished. If they don't, you only have one seam to look at and correct. Don't proceed until all measure what they should. pair unit. Your border should measure 3 1/2 x 42 1/2 unfinished. Repeat to make four Four Patch borders. 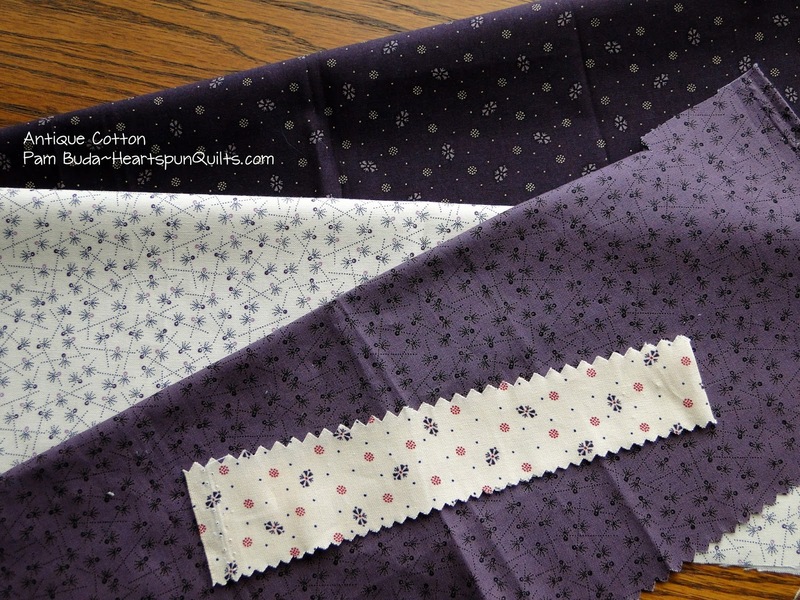 Sew two borders to the sides of your quilt center, press. Sew a Four Patch cornerpost unit to both ends of the remaining borders, press. Sew to the top and bottom of the quilt center, press. The red "chain of squares" will bend the corner nicely! Refer to your pattern and check to be sure your quilt measures what it should. 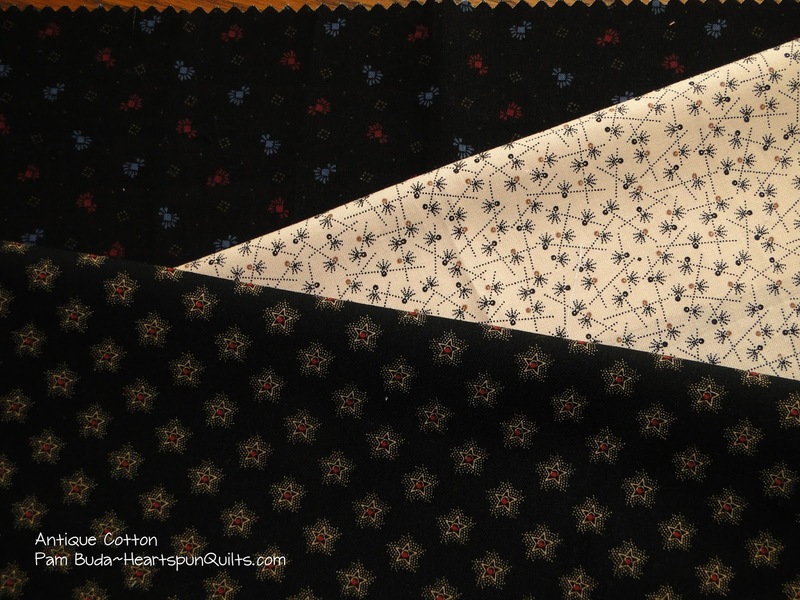 Then, proceed with sewing the next plain border to your top. Here's what our quilt looks like after Month Nine!! So exciting!! You'll also be constructing some Shoo-Fly blocks and working on Half Square Triangles for the Triangle Sawtooth border. It's all coming together!! Only a few more months to go! What To Do With All These Quilts? 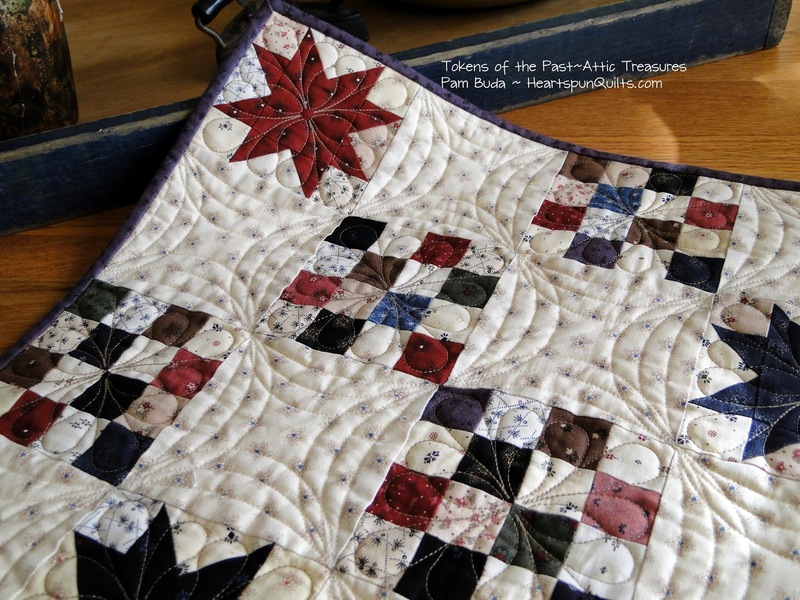 What you do with your quilts? 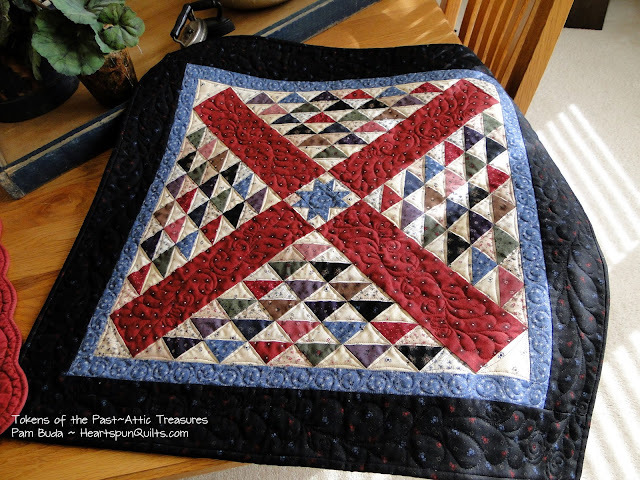 How do you store quilts you don't use or display in your home regularly? Any advice would be appreciated, and I think many others would benefit from your ideas! This will be short and sweet and use nothin' but scraps. Details will be posted right here in a couple of weeks, and it will be over before the holidays. So....get ready for a little stash raid!! Antique Cotton Bundles Are Ready!! My Antique Cotton fabrics have begun to arrive! Finally! I've been so, so jazzed about receiving them. We've been busy cutting bundles for you and they're ready to ship. ...here are the prints for your viewing pleasure. ....black, brown, green, blue, red, plum and dusty pink! Your local quilt shop should be getting their order as well. 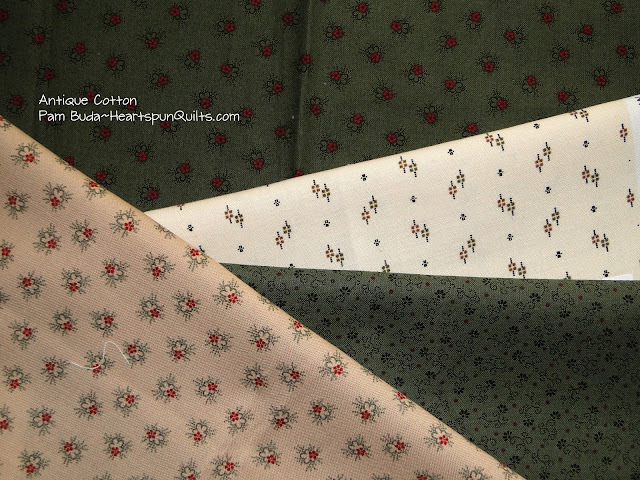 So, pick up some Antique Cotton to add to your collection of fabrics!! 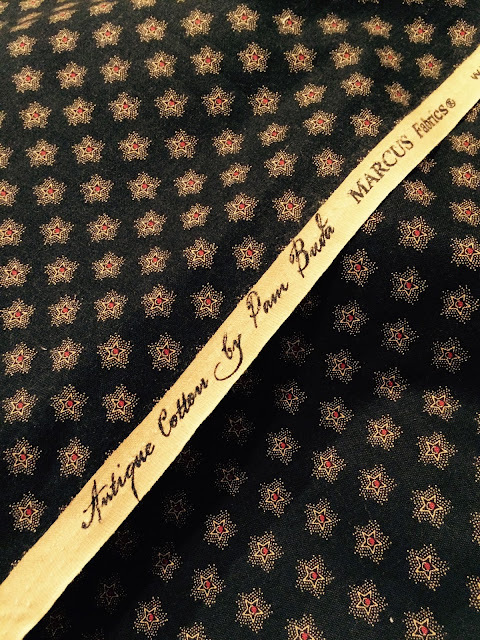 You can see the entire collection on the Marcus Fabrics website. 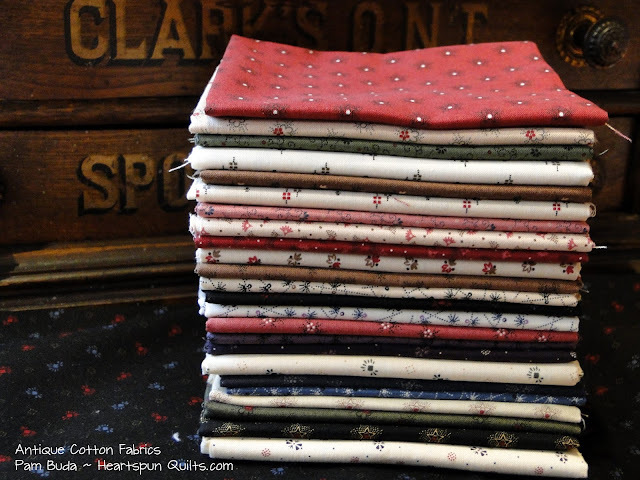 Click here to order a Fat Quarter bundle of Antique Cotton. 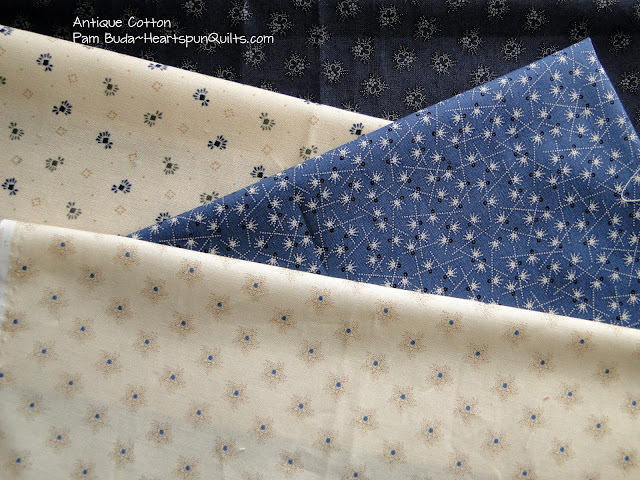 Click here to order a Fat Eighth bundle of Antique Cotton. 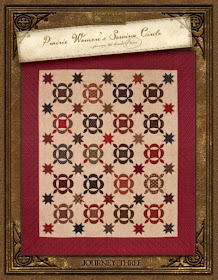 Also, I wanted to remind you that my Love Worn quilt kit special offer is about to end on Monday, September 14th!! This is a great deal and so many of you have already taken advantage of this. 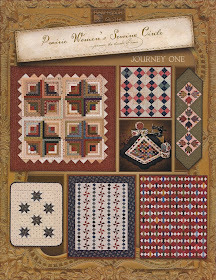 The fabrics are due to arrive very soon, and we'll be getting this kit and sending it on its way to everyone. Click here to read all about this great deal! 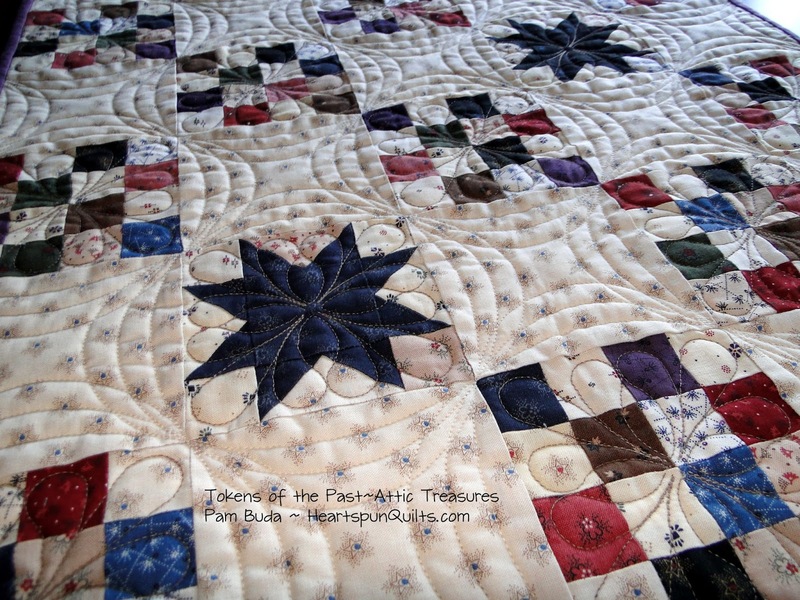 This quilt features all of the Antique Cotton fabrics. 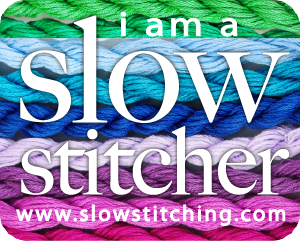 Hoping you find some time for slow stitching!! September and October bring lots of new and exciting things from my studio. 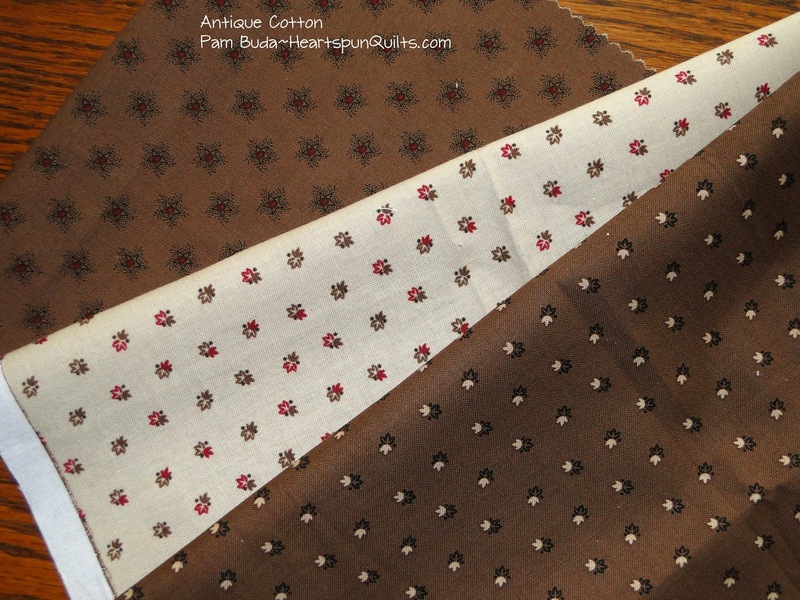 The new Antique Cotton fabrics are beginning to arrive with the precuts coming soon. 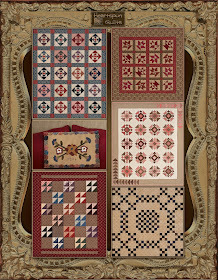 New pattern releases in time for fall market, and a very exciting and different celebratory event coming in October all have me looking for space for all this new stuff. So...I'm having a pattern sale!!! 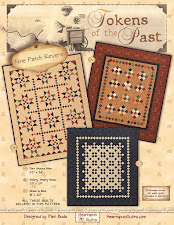 Purchase each pattern for just $5 !! And...that includes postage within the US! I just adore Fritzie's Closet!! It hangs on a quilt crane in my bedroom and every day I enjoy looking at the blocks of fabric combos and it makes me happy. If you love matching fabrics for blocks, you'll love making this quilt. The sashing is added to each block, then the blocks are sewn into rows. 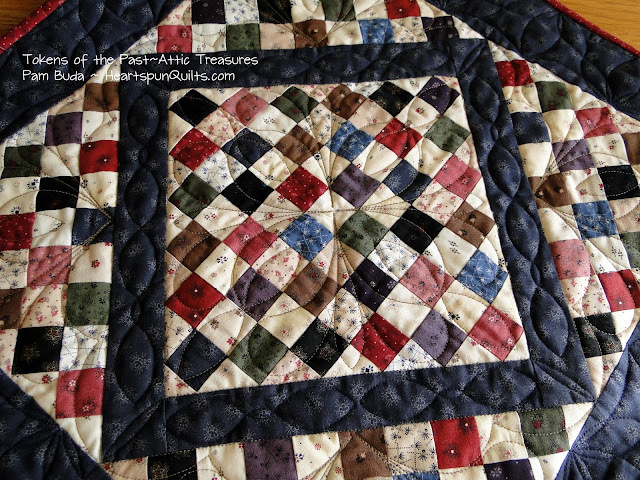 If you love scrappy...you'll love this quilt. 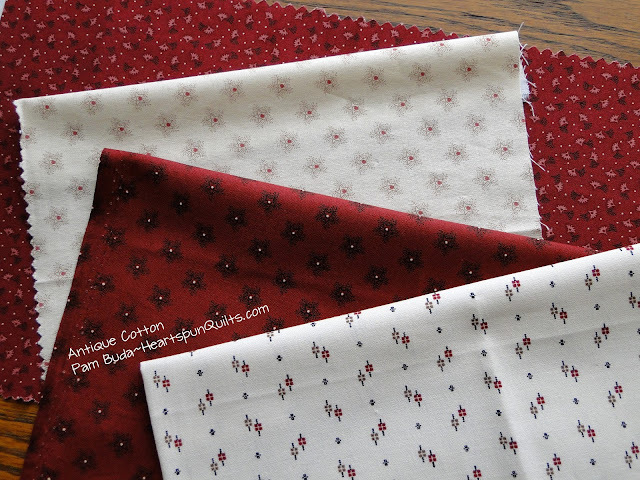 There are so many fun design possibilities with Ada's Prairie Stitches! 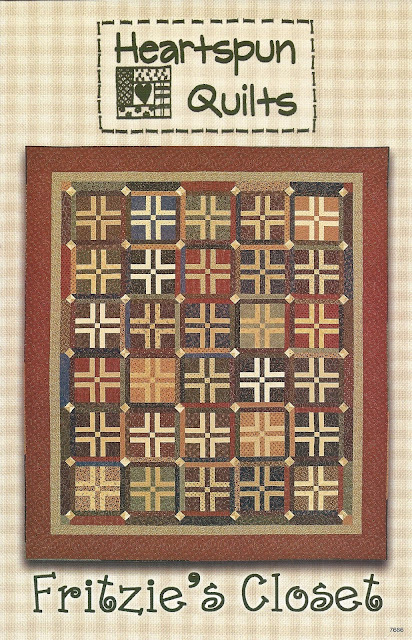 This easy block has a lot of movement to it giving life to the quilt while you play with the fabrics in the setting and border. 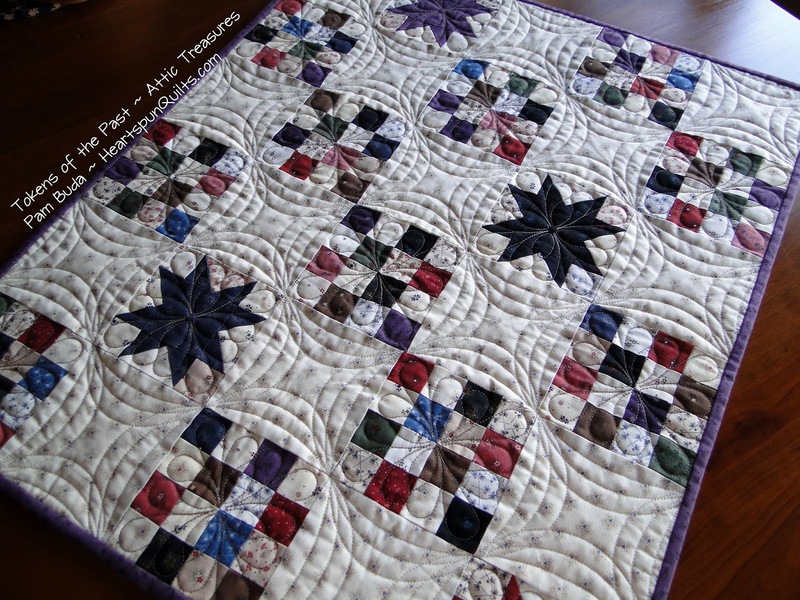 Another quilt for playing with fabrics in the blocks....I just love that! I was inspired to create the first Wee Whimsies pattern because I wanted a little touch of fabric here and there. 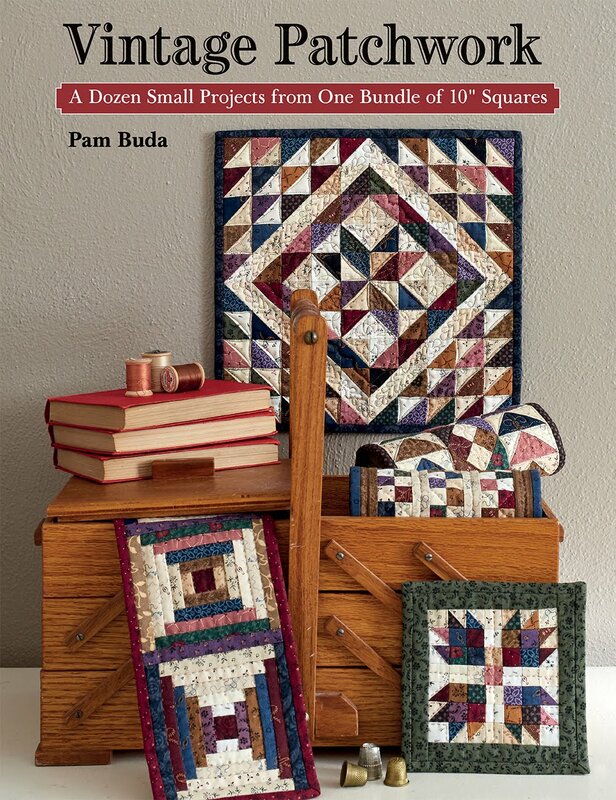 Hung from a door knob or a drawer pull, tucked inside a basket, decorating a gift for a quilting friend, the possibilities are endless! I wanted them to look like they had binding, but certainly didn't want to bind a 5 inch quilt. Easy and fun were the criteria, and that's just what they are, and I had so much fun creating them, I did it again with the second set of block quilts in Wee Whimsies Round Two!! 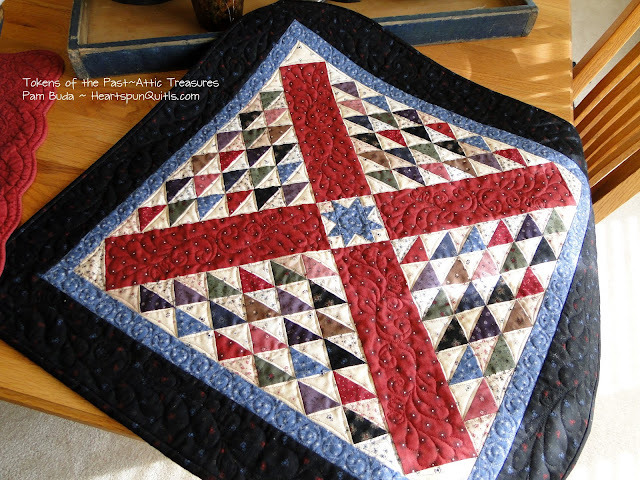 Most are pieced blocks, some are paper pieced and just a few are appliqued. If you ever want to try a new technique, this is the way to go because you don't have a big investment of fabric and time. They make great Christmas ornaments, too, and would be very cute pincushions!! Oh and....ssshhhh...one of these cuties will be seen in a national magazine very soon!! 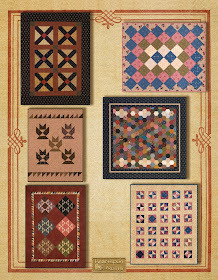 Click here to order these patterns for just $5!! !